Get ready to dance by the campfire and summon the slot spinning spirits into action. Shaman’s dream will take you on a journey of discovery. Let the ancient traditions of Native America guide you along your winning path. 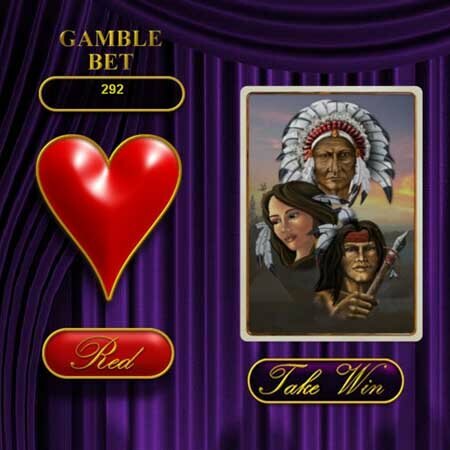 This beautiful video slot, designed by gaming experts at Eyecon, draws you into the sublime world of the ancient American Indians. The awe inspiring graphics provide a vast landscape, overshadowed by a twinkling moonlit sky. Explore a unique civilization and uncover the mysteries and wisdom of their revered Shamanic leaders. The 5 reels and 25 pay lines are all under their spell. Discover symbols and charms containing an abundance of winning incantations. From the wigwam to the buffalo, every symbol has its underlying meaning and purpose. The tribal elders keep you drawn in with a top base award of 9500x your bet line. You’ll also discover Scatters and Wilds, along with Free Spins that triple your win. Just be prepared to receive some magical payouts. Shaman’s Dream is packed with magical features. You can control your own destiny by moving the Bet Up and Bet Down arrows in the Change Bet section. You can also adjust the number of lines with the Line Up and Line Down buttons in the Change Line section, and with bets ranging from £0.01 to £250.00 per spin, there’s something for everyone. Shaman’s Dream lets you press the spins yourself, or use Autoplay to do all the work and launch up to 100 games for you. It doesn’t end there. The Gamble feature enables you increase your winnings in a nail-biting round of double or nothing. With a max payout of £32,000, we reckon it’s worth the risk. You’ll be pleased to know that this dreamy game is available for mobile too. 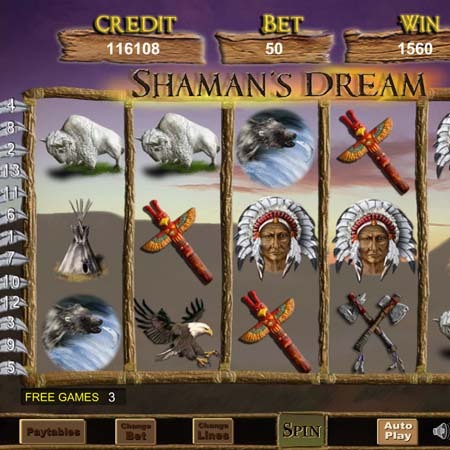 Download Shaman’s Dream to any Apple or Android device, where you can also enjoy the enhanced graphics and animations. The spirits will be watching over you in the Shaman’s big bonus game. 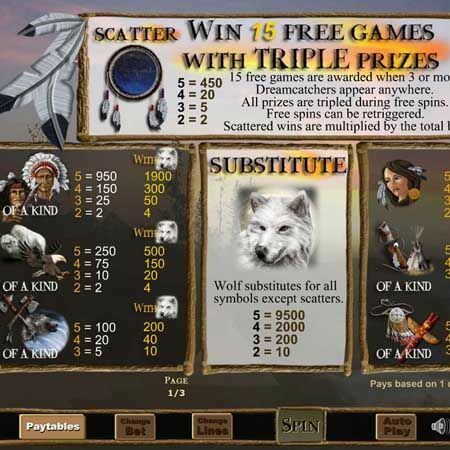 This Free Spins game will be triggered when you land three or more dreamcatchers anywhere on the slot reels. To begin with, you’ll receive a whopping 15 bonus rounds, where the win value is tripled. There’s more… If you land and additional three dreamcatcher symbols within the Bonus round, the feature can be retriggered up to 15 times, making for exciting game play plus huge potential for wins. As well as the dreamcatcher, the white wolf can also double the value of your winning pay lines. There’s a max multiplier of SIX TIMES your win whenever this symbol pops up during your free spins. Get 15 bonus rounds, which can be retriggered 15x more! If you believe you can win and wouldn’t say no to a little extra help from the Shamans, then this game is for you. You’ll master this online slot in just a few spins, plus you will enjoy the plethora of magical features, not to mention the game’s stunning settings. Go on, we dare you.